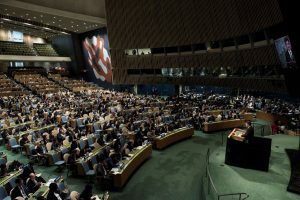 The Third Committee of the 72nd session of the UN General Assembly adopted the draft resolution A/C.3/72/L.18/Rev.1, with oral amendments from the co-facilitators(PP9 and OP14(a)) and African Group (OP18), with a unanimous recorded vote of 176 in favour, at its 53rd meeting on 21 November 2017. The draft resolution A/C.3/72/L.18/Rev.1 entitled “Implementation of the Convention on the Rights of Persons with Disabilities and the Optional Protocol thereto: situation of women and girls with disabilities” recalls the GA resolution A/70/145 of 2015, and shifts the strictly procedural resolution to a substantive one focusing on specific themes. In line with the report of the Secretary-General on the situation of women and girls with disabilities and the status of the Convention on the Rights of Persons with Disabilities and the Optional Protocol thereto (A/72/227), the resolution recognizes that women and girls with disabilities are faced with multiple and intersecting forms of discrimination which poses barriers in all aspects of life, and therefore focuses on a number of key issues critical to realizing their rights on the equal basis with others, namely (1) multiple and intersecting forms of discrimination; (2) education and employment; (3)access to health services, including sexual and reproductive health; (4) access to justice and equal recognition before the law; and (5) participation in public and political life.